I had a feeling it was coming but didn't expect it so soon. Almost immediately after the elimination of sugar from my diet, I got a banger of a headache. Typically, I would take a few Motrin at the first sign of a headache and that would pretty much take care of it. However, this is the Survivor Diet Challenge and Motrin is not on the menu. I'm going to have to tough this one out and see how long it lasts. . .
Holy crap. What a hellacious day. My head was pounding for so long that I started getting worried that something else might have been wrong with me. I took a hot shower for about a half hour just letting the water rain down on my head. That helped - but only temporarily. As I write this (the next day) I still feel lingering pressure like I'm either on the verge of a headache or on the verge of recovery. It's an odd feeling. Because it is MUCH better than I was feeling yesterday, I am so grateful that I am no longer suffering. Let's hope that it just continues to improve from here. I do have some history to refer to on this matter which is another very helpful reason to write these logs of my experiences. I knew this was coming. Sometimes it's Day 2 and sometimes Day 3 but the trend is too obvious to ignore. On the bright side, I also know from experience that after I suffer through this headache hell it usually means clear sailing for a long time afterwards. Knowing this, makes it worth it to me to push through the pain in order to get the gain. In my opinion, people (like me) who suffer from headaches on a regular basis can absolutely manage them by controlling their weight and sugar intake. I have gone through this experience enough times to know that many ailments of the body can be managed in a similar way - it's just up to the person and their will-power to make a change. The healing mechanisms in our bodies will automatically do the rest if we feed ourselves the right fuel. On the survival front, today I mustered up the energy to go trout fishing in the afternoon and I am very glad that I did. In about one hour at the local pond I caught my daily limit of six trout. The secret to my success today was in the bait - butterworms. In the past I have been out-fished by several people who had the right bait while I could only sit and watch. Not this time. This time I was the one catching while other anglers were watching in amazement. One after the other I just kept getting bites and landing fish. It was awesome. On my way out I decided to ''pay it forward" and give the other fishermen the insight that I had learned from past experience. Additionally, I gave them several butterworms to use for bait and they were very appreciative. I didn't stick around to see if they were as successful as I, but I have a gut feeling that there were some pretty big smiles shortly after I left. Later at home I rummaged around in the garage looking for parts to build a squirrel trap (see the 'Small Animal Clause' on the SDC Rules page). 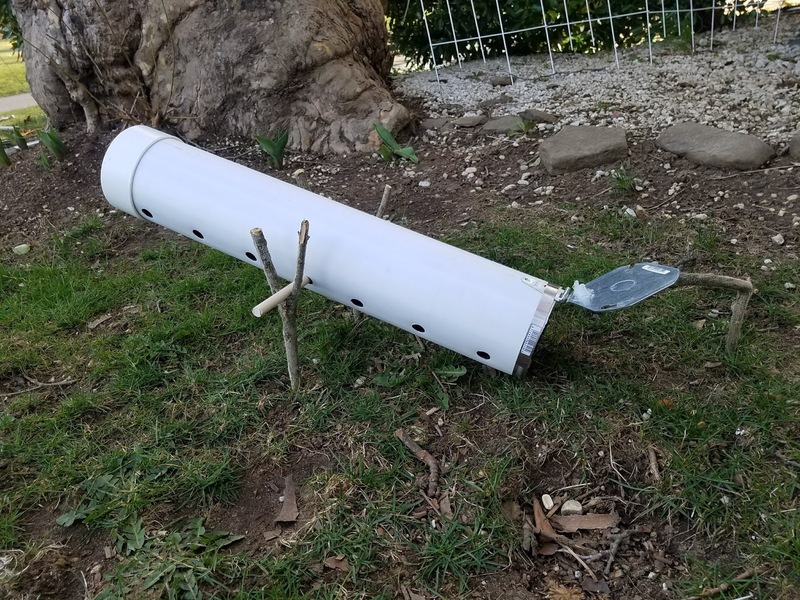 I came up with a PVC tube contraption that is a non-lethal trap intended for catch and release. It's a relatively simple design. The squirrel goes in to get the nuts inside. As it crawls to the rear of the tube its body weight causes the tube to tip up enough to trigger the front door to close. I glued a powerful magnet inside the front of the tube which locks the metal door as it shuts. We'll see. I'm sure I will have to make modifications to this device after the first batch of squirrels outsmart me as usual. I have a few other ideas in the works for bird and small animal traps that I can place in my backyard. With my headache today I was pretty impressed that I was able to do anything at all.